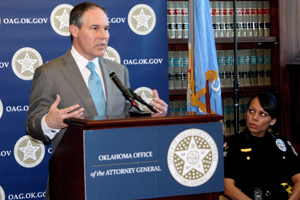 OKLAHOMA CITY – Attorney General Scott Pruitt on Wednesday awarded the latest round of Safe Oklahoma Grant awards to law enforcement agencies across the state. The recipients of the 2015 Attorney General’s Safe Oklahoma Grants are the Bartlesville Police Department, Broken Arrow Police Department, Bryan County Sheriff’s Office, Chickasha Police Department, Durant Police Department, Midwest City Police Department, Oklahoma City Police Department, Sapulpa Police Department and Tulsa Police Department. The grants provide funds for each law enforcement agency to use a variety of techniques to target violent crime in Oklahoma communities. The grant funds will help local law enforcement agencies to directly target crime hot spots in their communities through strategies like increasing the frequency patrols in known, high-crime areas. “The sole purpose of the Safe Oklahoma Grant program is to help law enforcement to reduce violent crime in our communities around the state. 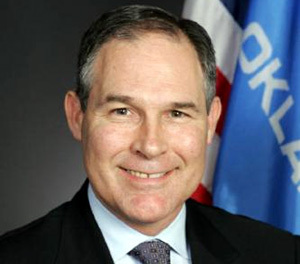 By providing funds to help implement evidence-based policing strategies, this grant gives our local agencies the ability to increase the number of boots on the ground, as well as find innovative ways to increase the safety of our communities,” Attorney General Pruitt said. 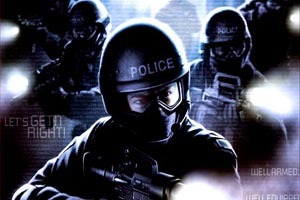 The Attorney General’s Safe Oklahoma Grant program, established in 2012, is funded by an annual appropriation from the state Legislature and provides local law enforcement agencies with additional resources to fight violent crime in local jurisdictions through overtime patrols and enhanced technology and analytical capabilities. In addition, the Safe Oklahoma Grant program provides law enforcement the opportunity to learn about evidence-based strategies used across the country at the Attorney General’s annual Best Practices in Public Safety seminar. Law enforcement agencies interested in more information on the grant or application process, should contact Emily Shipley at (405) 521-3921. This entry was posted in State on June 3, 2015 by admin.